Vocabulary is destroying your test scores. Here’s how to fix it! Vocabulary Development. Would you believe me if I told you I took a whole class with this title in high school? I took the course an English elective because I had heard it was an easy way to get a credit. The rest of my schedule was full of AP this and that, and I desperately wanted a blow off credit. The teacher was as close to retirement as and human could possibly be, and while I would learn to love him, he could be a bit of a loose cannon if you weren't quite living up to expectations. Why do I tell you all this? Well, Vocabulary Development turned out to be a class that has helped me in literally thousands of daily interactions. 1. Research has shown that 5th graders pick up between 1,000 and 5,000 new words in a year (Stahl, 1999). 2. Vocabulary has a big impact on reading comprehension. 3. Struggling readers won't pick up vocabulary just by reading books. 4. Word learning happens best when done through multiple means. 5. Dictionaries don't cut it. 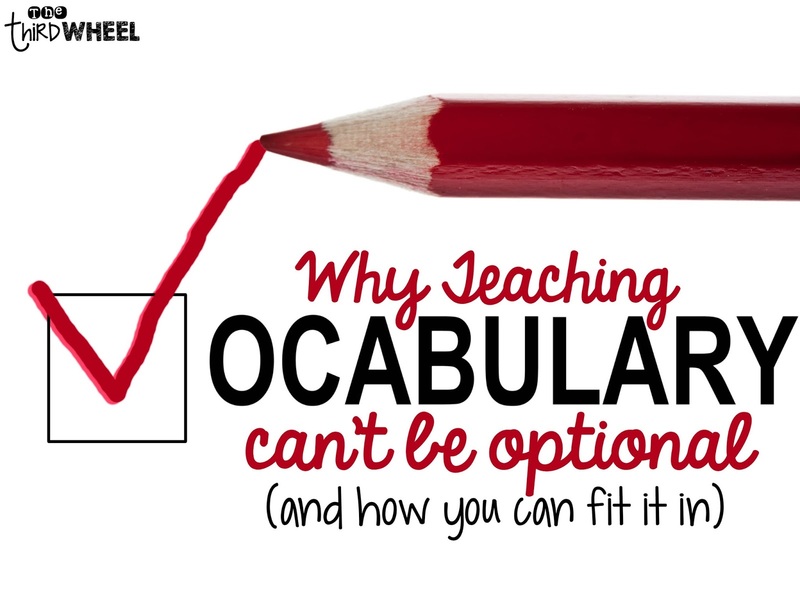 Vocabulary is great…but I've got a lot to teach! How to fit vocabulary into your routine. While I had the luxury of taking Vocabulary Development in high school, so many students are struggling with academic vocabulary in elementary school. During my time as an instructional coach for interventionists supporting struggling learners, I saw numerous students who were failing because they didn't know the terms being used. In fact, I even worked with several groups of students who had failed their state testing and, by only focusing on academic vocabulary during our time together, they were able to pass the second administration. For this reason, I make a focused effort to teach vocabulary in my classroom through authentic interactions and direct instruction and I encourage my team to do so as well. Today I want to share the research behind my experiences and explain why vocabulary is probably one of the biggest factors impacting your standardized test scores. Pretty amazing, right? That is a TON of vocabulary. However, think about it from a slightly different angle, and it becomes terrifying. The students gaining 5,000 words during the course of that year have a 5x larger gain than the student only gaining 1,000. If that continues across several school years, by the time two children at the far extremes leave middle school there can be an enormous difference between them. Which of these students is most likely to be able to read grade level texts better? Write higher quality compositions? Have strong, content-related conversations? And the differences you see in the table don't account for any differences in vocabulary that the students come in with at the beginning of the year. Not that shocking, right? Knowing more words helps you understand what you read better. Whenever I am reading with students, I often have them stop to explain what they've read. More often than not it is just a word or two that has thrown off the meaning of the whole paragraph. You might be surprised to know that when researchers looked at struggling readers in 2nd grade and up, their language comprehension skills (aka their vocabulary) was so low that it actually prevented them from getting anything out of most grade-level independent reading. When we can build a child's vocabulary, we are really teaching comprehension in an indirect way. I was totally guilty of pushing context clues my first few years of teaching, and I was bewildered when my students weren't picking up all the rich vocabulary I was exposing them to. I mean, how could that be? Over the years I naturally started tailoring my vocabulary instruction to be more direct with repeated opportunities to interact and use the vocabulary. As a result, my students began using the words we were learning. The research supports my trial-and-error discovery. While most teachers do not explicitly teach vocabulary (the research says as little as 1.5 minutes of a reading lesson focused on vocabulary), it is truly the way to help the students add that word to their word bank. Students need opportunities to build words into their schema and to do that they need numerous exposures. They cannot just read the word in context and be done. Research supports introducing and exposing students to vocabulary through multiple modalities, as well has hooking it to their prior knowledge, is huge in helping kids make gains. This can include: reading, writing, non-verbal representation (drawing or acting), classifying words by part of speech, exploring semantic connections (synonyms, antonyms, word webs), and discussion (Marzano, 2004). Students need clear, child-friendly definitions (Massachusetts Reading Association, 2011). They need opportunities to write their own definition after several exposures, and they need opportunities to experience the word in context if we want our vocabulary instruction to stick. While I may have learned quite a few words from my vocabulary development class, we studied 20-30 words per week for 9 weeks of instruction. We spent a lot of time looking words up in the dictionary, and well, we did a lot of activities that go against our current knowledge of how to make vocabulary stick. As a result, I still come across words regularly that I know we “learned” in my class. However, I lack the definitions for many of them because they were never connected to my experiences or other words I knew well. Vocabulary instruction needs to be accessible to kids or it is just a waste of time! I totally get that. The number of standards we are currently teaching is a pressing weight on any teacher's shoulders. I found that morning work (or right after lunch) was a perfect time to build in 5-10 minutes of vocabulary work. Using a number of resources, I identified words that would give me a good bang for my buck in terms of covering a variety of settings (socially and academically) and would help my students build the word bank they needed for success on state testing. Then I designed a set of activities that incorporated the best practice standards. It was important to me that the set was both useful and efficient since I am always pressed for time. After testing it out, I made a few additional adjustments, and discovered that I love explicitly teaching vocabulary this way! I highly recommend that you consider your students vocabulary needs, and start a set of activities in your classroom. It was fun to hear my students begin to notice these words in daily conversation and to start incorporating them into their own speech. I also found that my students had a better understanding of the questions and passages we were reading. For a sacrifice of 5-10 minutes per day, it was totally worth it. The research is clear, and we know vocabulary is a huge predictor of success….in life, in school, and even on those dreaded standardized tests. When we identify high power words and make sure our students know them, we help give them get the edge they need for success in our classroom and for years to come. Find time in your schedule to give some daily instruction to those critical academic vocabulary words. Build them into your bell ringer or dismissal routine, find a few minutes as you prepare for lunch, or (even better) during your language arts block. Your students will be the better for it. Don't have time to make your own? You can borrow mine! Click below to access the right set for your students. I have purchased some of your vocabulary products. Just wanted to say that they are well done and quite a help at our school. Thanks for such a quality product! If you’ve not seen the work of Pat Pavelka, I think it would interest you. Thanks so much! I appreciate your kind words, and I am definitely going to check Pat Pavelka out. The name sounds familiar, but I am definitely not 100% sure. I see you cited the facts in your post. I am just looking for the links to these for my own research for a college course i am taking. Can you point me in the right direction for your cited pages? Thanks! A lot of the citations came directly from Marzano’s Academic Vocabulary book (Here’s my Amazon link: http://amzn.to/1PAdPyw). It has great lists of vocabulary separated by grade and instructional routines.